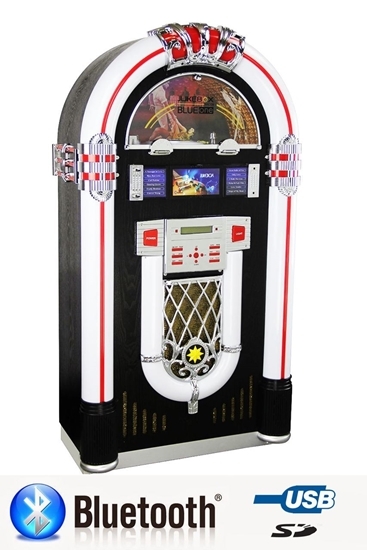 Full Size Jukebox BlueOne Techno. Travel back in time with Blueone Techno Jukebox. But don't by fool by this nostalgic look, It has all the modern technologies you need with is bluetooth connexion, SD card or USB key slot to enjoy all your favorite song or playlist. It never been easier to listen your friends or family members favorite song with our bluetooh connexion. . You can also tune to your preferred AM/FM radio station or pop in your favorite mixed CD.